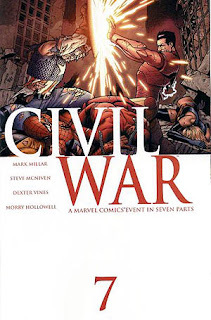 This post is an analysis of the movie in comparison to the comic book counterpart. As such there are a ton of spoilers in this post. To read the post, highlight the text below to read as I have made the font white on a white background so people do not stumble upon the spoilers by accident. 1. Original comic series which was 7 issues written by Mark Millar and drawn by Steve McNiven back in July 2006 also centered around Captain America and Iron Man at odds over the Superheroes Registration Act. 2. The catalyst for comic book version of the superhero registration act is the super villain Nitro blowing himself and a good part of Stamford, CT along with most of the super hero team New Warriors. 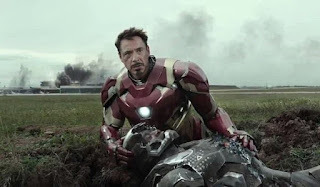 In the movie the last straw was when the Scarlet Witch took out Crossbones in Lagos then had a lot of civilian injuries and casualties, and set in to motion "The Segovia Accord." 3. As you know from the trailers already Spider-Man is introduced. 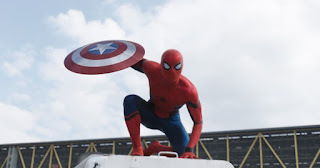 But in the movie he is also shown in his Peter Parker identity as he and Tony Stark meets for the first time in the film. 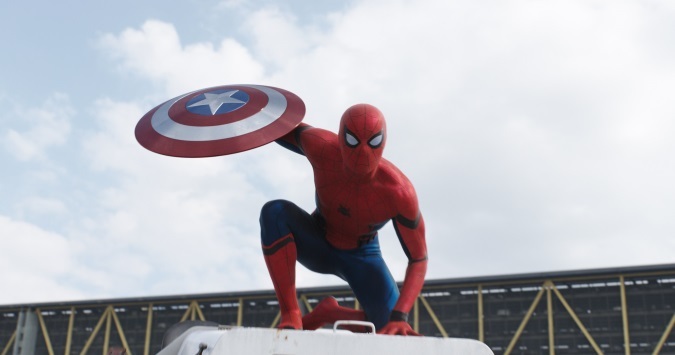 Tom Holland's is noticeably younger than previous incarnations of Spider-man in the other Spider-Man films. Both Tobey & Andrew were in their late 20's when they don the costume. Tom is age 19. Aunt May likewise is noticeably the youngest among all incarnations (in both films and comic) played here by Marisa Tomei (age 51). 4. Most noticeable about this version of Spider-man compare to the comic book or other films is his apparent lack of spider-senses. They are one of his many powers, with his spider-senses a kind of warning system to impending danger. In the film, during his battle with Falcon & Winter Soldier they are able to blindside him. This may be explained later due to his inexperience but however in all incarnations, spider-senses are always one of the powers he discovers first. 5. Col. Helmut Zemo who in the comics is the son of Baron Heinrich Zemo a Nazi nemesis of Captain America during his World War 2 days. His origins is totally different as are his motives in comparison to the film. In the film his motives against the Avengers in general is to avenge his family. In the comics it is often to avenge his father's death at the hands of Captain America or world conquest. As well, in the comic, he is often shown wearing a mask due to disfigurement. Unlike his depiction in the film sans mask. 6. After credit scene 1 - We see the Winter Solider going into cryogenic stasis voluntarily due to him still having mental programming from the Winter Soldier program. This is a courtesy of the Black Panther in Wakanda as he sees Bucky and his father as both victims, and wanting to be able to help Bucky when he couldn't his father. 7. After credit scene 2 - Set in Peter Parker's home, Aunt May notices Peter's bruises and inquire about them. He replies it is from a bully in school. Steve from Brooklyn (referring to Steve Rogers who tells him earlier that he's from Brooklyn). 8. Stan Lee plays a Fed Ex delivery man that delivers Tony Stark a letter with cellphone from Steve Rogers towards the end. He last played a courier in a marvel movie in Fantastic Four (2005) when Chris Evans was still the Human Torch. 9. A big turning point I felt in the comic books is the death of Goliath (Bill Foster) in the war between heroes. The turning point in the civil war in the film would have to be War Machine being shot down accidentally by Vision. Coincidentally Goliath was also shot (albeit killed) by not a man but a clone of Thor. 10. Civil War in the comics ended with Captain America in handcuffs (who later is murdered by Crossbones in Captain America issue #25). In the film, Captain America and "his" Avengers are on the lam still having escaped the Raft, a super prison meant to hold powered criminals. Which in turn makes them a Secret Avengers team. In the comics, the Secret Avengers were formed after the dissolving of the Superheroes Registration Act also under the guidance of Steve Rogers.